I'm just so proud to have a child who SITS and plays. This is our long-awaited "1 year milestone." 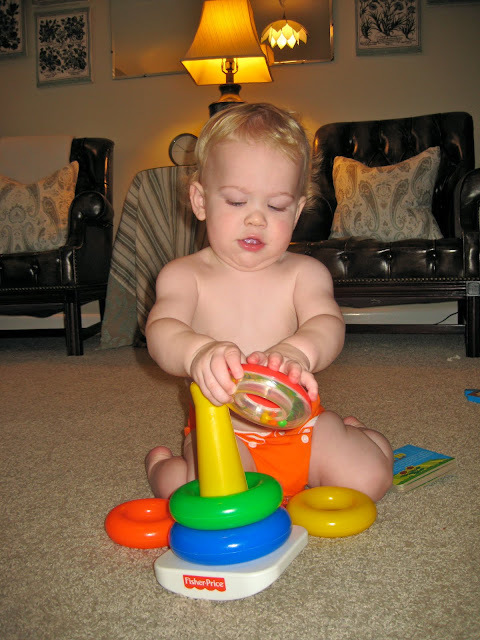 Regardless of whether or not he is simultaneously watching a movie or harboring bacteria and viruses that are effecting his energy level--he is sitting and playing with a toy in the way in which it was designed to be played. That just hasn't happened a lot at our house up until now. I hope this is the beginning of something beautiful. 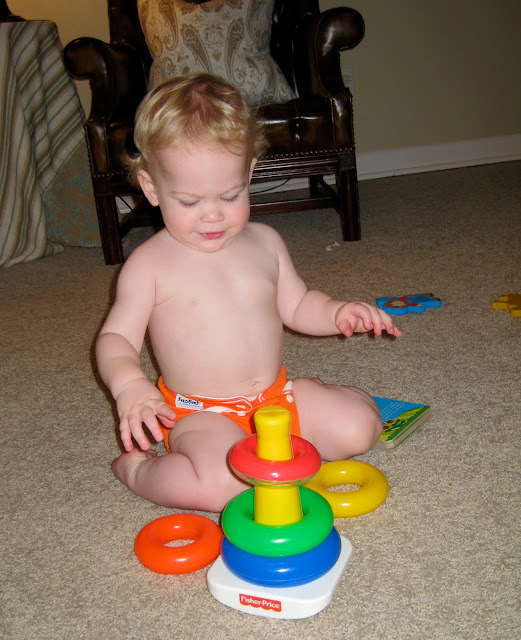 You'd think from this picture that maybe this is also the first time he's polished off the ol' fine motor skills. Worry not. He's been taking the battery cover off of the back of the remote controls for months now. All different kinds at all different houses. So, he seems to be ok in that department. No wonder he wasn't interested in the stacking rings. 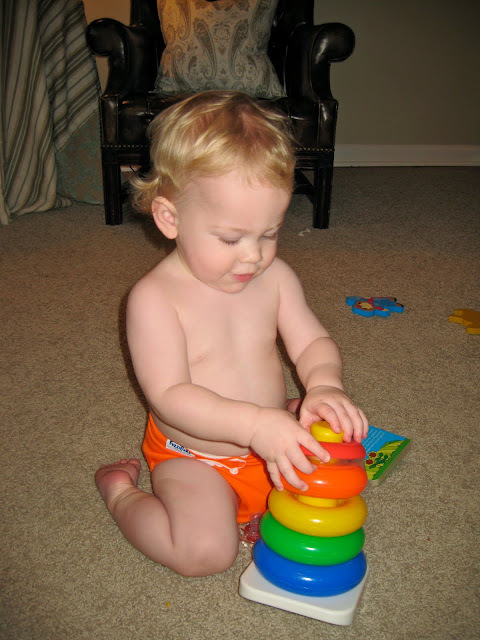 Basking in new-found pride due to his stacking abilities and looking pretty cute in his cloth diaper. Am I right? His aunt Hillary said he looks like a little "man cub" ("The Jungle Book" vernacular is still alive and well in my world). 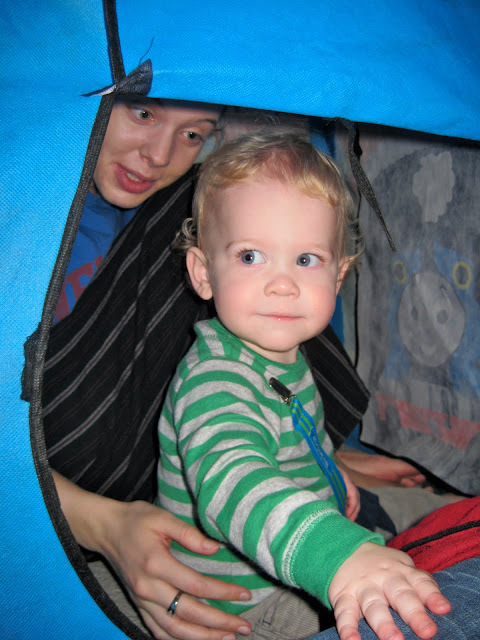 While visiting my parents' house, Spencer decided he wanted to play in his tent. But he didn't want to play alone, and his wants are seldom thwarted due to the loud volume at which he typically "protests" and the undeniable vigor with which he aggressively pursues his goal. However, as is the common experience of man, once you attain your desires, you find yourself wanting even more. See his little hand above? He is already reaching for something more. And she gave in. Note the expression on the face of the victor, and you will notice that he remains unsatisfied. He wanted me in there too. 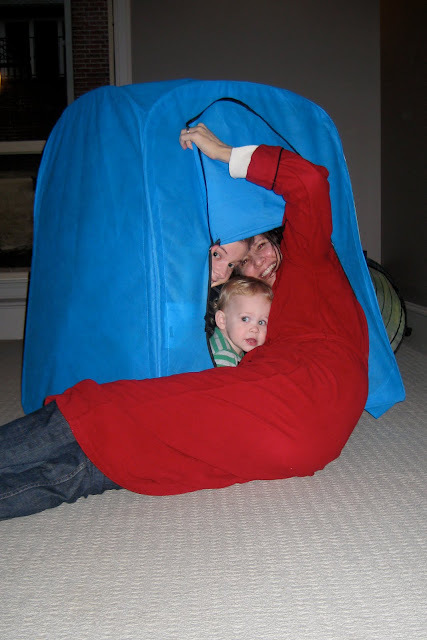 However, we rose to the occasion and managed to distract him with his tunnel. In which he insisted his aunt Natalie again accompany him. And so it continues. Or: "Ways To Know You Have Lost Any Semblance of Control (Real or Imagined)"
10. It is truly easier to cook an entree with a few sides than to attempt a meal at any restaurant at any time, day or night. 9. You consider forgoing the whole concept of dinner altogether. 8. It has become commonplace to pull out pieces of toilet paper from a crumpled up pile off the floor rather than to tear it off of a roll. 7. It's not longer fun to go to Target (unless you are alone). 5. There is nothing you actually need or use in your bathroom drawers, only a few clippies and a hair brush. All items you'd like to see again in good condition have been carefully squirreled away, in high places where you child will never be able to get to them--for at least another 3 months. 4. Baby clothes marked 6-12 months look so small! 3. You actually consider looking through the trash before you take it out in case your child has managed to throw another book in there while you weren't looking. Then you realize that one less book really wouldn't be the worst thing. 1. You are in no hurry for your child to start using "real words" for fear that you already know what he's not yet able to say. Waiting to "get the party started." If you knew how I'd envisioned the "party table" to look, you'd know why this was a disappointing set up. I just couldn't get it all pulled together. Fortunately (or unfortunately? ), I'm the only one who will ever know or care. A house full of family members upon waking from a nap did not sit well with Spencer. It took about ten minutes for him to decide that the circumstances pleased him enough to allow us to proceed with the festivities. I learned that I have not in fact missed a life-long calling to baking. The cake WAS completely cool before I iced it. Luckily, when you put a bunch of lighted candles on something edible it automatically looks a little less ugly. A room full of people singing to him--very nice. It was a birthday miracle that he wore his cutie little hat! The first try was met with quite a negative response, but the second try was fast and apparently imperceptible amidst all the birthday distractions! Thrilling gift from (my) Aunt Valerie. He still loves it. He would have been happy to stop there. I would have been happy to stop there. But, apparently, social protocol dictates that children be given grotesque amounts of material goods that they neither know they want nor need. Loving his bee-bop band instruments from his Aunt Hillary, but not as much as he was loving the room packed full of people giving him their undivided attention. He walked each new gift around the room, grinning and waving it around like (happy and innocent) spoils of war. 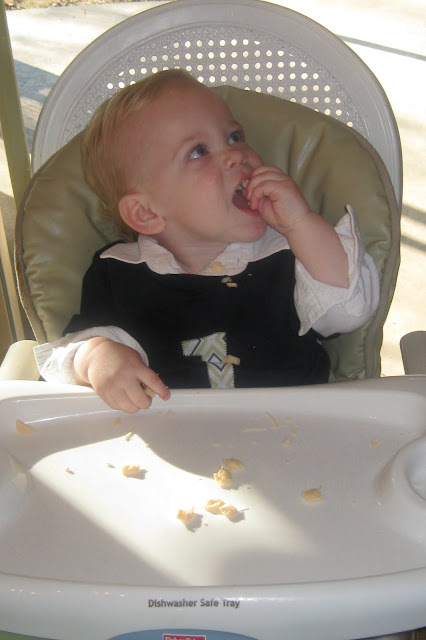 You may notice the absence of the "baby with cake smeared all over his face" picture. That's because Spencer refused to eat cake. Trust me, I tried to entice him. However, once everyone left, he decided he would like a little string cheese. On October 31, 2009 (chuckle) I hosted a Harvest Party. I hope to do one every year that I have children who will enjoy it. I'm not a fan of focusing on the death and darkness part of Halloween, but there's so much good food and fun to be had without all that. Plus, it's shameful how many close and precious friends and family I have in town that I seldom see. Any excuse for a party is an opportunity to see each other! Also, as is always the case, a much needed kitchen appliance broke the day before the party--the microwave! It was only a year old. Actually, the microwave did not break, the microwave plate inside shattered into hundreds of pieces inside the microwave while I was using it. Scared me to death. The manufacturer said the plate probably had a small crack in it to begin with, and they nicely agreed to send a new one. That's all fine and good but not helpful in my predicament. Most culinary experts will tell you that microwaves are not essential. However, I'd purchased 3 boxes of microwave popcorn to make popcorn balls. And I wasn't sure how to do that sans microwave. Now, if you are a rational, or shall I say, even-tempered individual, you are thinking, "Lauren, you can still use the microwave. Just take all the plate pieces out." And you would be right. However, I am not a rational, even-tempered individual and this bit of truth did not dawn on me until weeks later when the new plate came and I was cleaning little pieces of the old one out of the perfectly functional microwave. To be fair, it didn't dawn on my husband either. But again, I digress. Eventually, all crises were managed, and we had a party. I was thrilled that people actually came AND seemed to enjoy themselves. There was the added bonus of seeing little children dressed up as various animals! I wish I had a picture of the turtle costume one of our friends made for their little boy. It was adorable, and the perfect thing for him because he was just beginning to crawl, so you saw the his "shell" a lot. He looked just like a little Anne Geddes turtle baby! Spencer has the luxury at this point in his life of living near BOTH sets of grandparents. I should rephrase that. I have the luxury of living near both sets of Spencer's grandparents! So, they were all in attendance. 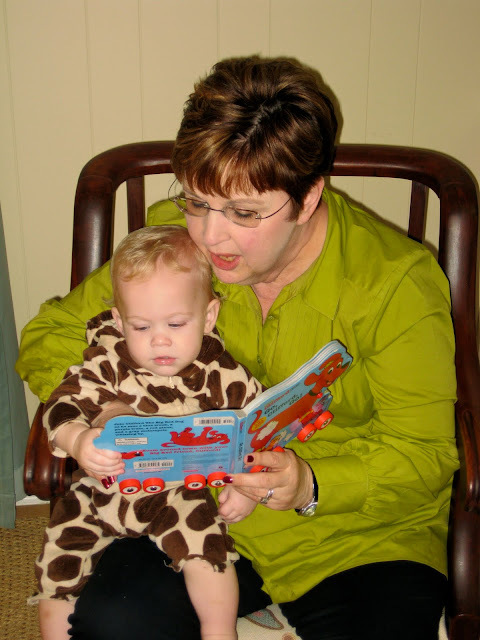 These photos are compliments of "Papa Kurt," and Nana brought a few new books to the party. One in particular was about dogs and had actual wheels, so it was an instant hit. My own mother apparently conquered all of her neuroses that held her back as she raised her own children, rose to the occasion, and came in costume! 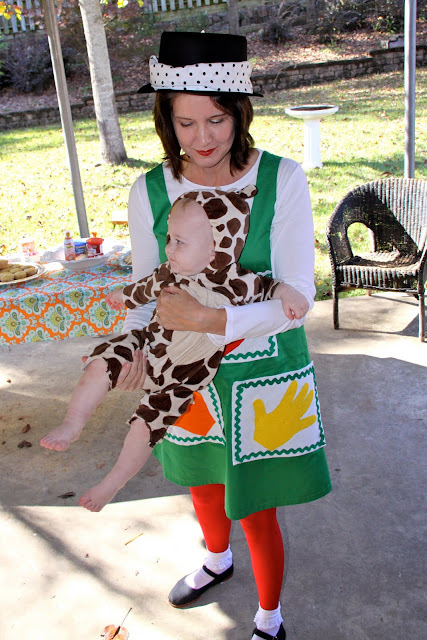 A hand-sewn costume, no less, of Spencer's favorite character--Miss Patty Cake. I'd been saying for months that the reason he liked Miss Patty Cake so much was because she reminded him of his Gigi. One of the noticeable similarities exists in their shared characteristic of tiny, but long and skinny, chicken legs (see below). A phenomenon of which I personally know nothing. Did I mention I've never seen her in a costume of any kind before? Seriously, never. Spencer took about thirty minutes to convince himself that this woman was, in fact, his Gigi. That, or it took him thirty minutes for him to decide to let Miss Patty Cake hold him. But after that, he was thrilled with the arrangement. You can see the ghetto caramel apples I made. I have to say, they were delicious. Unfortunately, they looked ridiculous. I had a moment of "brainstorming" when I convinced myself that the apples might come off of the sticks too easily and that forks (with their many tongs) were the obviously superior choice. Forgetting, of course, that forks have an angular shape that causes them to look crooked. Oh, blogging. Recently there are so many things I'd like to write about that every time I attempt to begin, I get overwhelmed and end up writing nothing. I have probably saved ten different "drafts" that I'll never finish. Story of my life. I have a sickness, if you know me well, then this is not a news flash. I HAVE to think ahead. That may sound like a helpful exercise to normal people, but I don't think ahead in a productive way. I don't think ahead for the day in order to work in a little elective reading or possibly an exercise dvd. I don't think ahead for the week so that we have meals planned, or for the month so that I make plans to see friends. I think ahead loooong-term. For example, this week I have been thinking about when I can work-in another 9.5 month nausea-fest in order to add another little baby to our family and how I want to decorate Spencer's "big boy room." The two events will probably coincide, so I figure, I should have the whole "big boy room" and possibly another nursery all planned. Also, I am going to use Jonathan's furniture from his old room, and it all needs to be painted. There's no way I will be able to paint it if I'm pregnant when we need it. But I can't paint it until I pick a color, and I can't pick a color until I know what fabrics I'm going to use--you see the digression. Additionally, I'd so like to enjoy doing these things, and that feels like an impossibility if I wait until it has to be done. So, I know I'm back to myself these days because this is what I find myself thinking about as I fall asleep at night. That and rearranging furniture. I had a little stint of that today as well. Feels great. P.S. "The Big Bang Theory" television show is nothing ground-breaking, but I've been watching the dvd's and I have to say--it does make me laugh. And at the end of the day, that's really all I'm asking. Well, that and my "rules." In case you aren't familiar, I insist that: 1) no children are in any way abused, 2) no people are killed by a natural disaster, 3) no one is killed especially point-blank on screen, and finally 4) no two people are consummating their relationship. Those just aren't the kind of think I enjoy watching.